AHS: Coven, which stars Jessica Lange, Angela Bassett, Kathy Bates, Sarah Paulson and Gabourey Sidibe, will explore “themes of race and oppression and family — especially mothers and daughters — along with laughs and scares and a few tears,” exec producer Tim Minear teased at the Television Critics Assoc. summer press tour last month. I really liked the first two seasons, with season 2 being my favorite, but so far I'm kinda "meh" on this third installment. Maybe it's because I've never been a huge fan of "witchy" themes, or maybe it's because these promos don't really impress me; remember the promo with the nun with black eyes crying tears of blood from last season? Now THAT was freaky and startling! 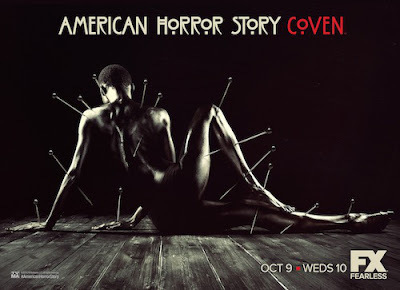 Anywhoo, American Horror Story: Coven premieres October 9 at 10/9c on FX. Check out the promos below and tell me what you think! This particular poster isn't that great......but I saw a preview where it looked like a bunch of schoolgirls were nailed to the walls by thiers heads....facefirst.....that looked interesting! Hmmm... that certainly ups the ante a bit!